José Ramírez Martinez was born in May 1922. At the age of 18, he began working in his father’s workshop and although he wasn’t given any privileges he soon became luthier first class. He didn’t take long in starting his experiments in continuing to improve the guitar as a concert instrument. Due to the lack of materials, his experiments weren’t very profitable, so father and son were constantly arguing. The father sold his son’s experiments without him ever having as clear an idea of the progression of his work as he would have liked. His brother Alfredo, who carried out the administrative work and who was his main ally, died in 1954. Alfredo was convinced that through his experiments José would succeed in his objective. His many investigations bore interesting fruits, such as in 1965 the discovery of red cedar for use as a soundboard which was adopted by practically all guitar manufacturers in the world, although at first it was hugely criticized for moving away from the traditional norm. He also tested many different varnishes given that in that era guitars were still being varnished with shellac, in the absence of a more consistent and richer varnish, which would not only protect the wood but would also enhance the sound of the guitar. Finally he managed to get the owner of a laboratory, who sympathized with his concerns, to produce a varnish with urea-formaldehyde as a base which gave an excellent result. He carried out several experiments on the length of the guitar string. He finally arrived at a length of 664 mm, which yielded the best result as far as sound projection was concerned without the sound being too long. However there was also a demand for a shorter string, which led him to design a guitar with a shorter string length of 650 mm. This was in 1986 and was named the C86 model, referring it to its year of creation. 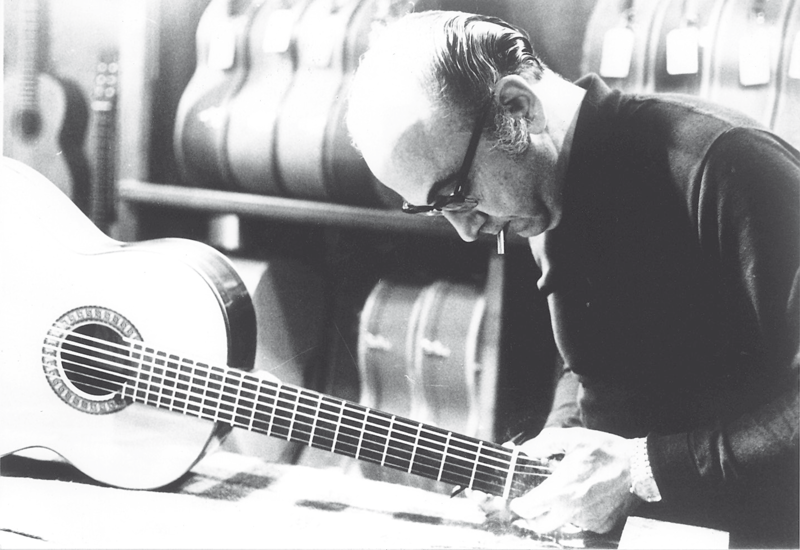 Later his son José Enrique modified his design, keeping the string length of 650 mm and changing its model number. In 1983 he designed a chamber guitar with the intention of eliminating the “wolf” notes (weak notes), and which gave quite positive results in amongst other things the cleanness and clarity of sound, which made this guitar a good instrument in recording studios. In amongst his experiments and research we have to make mention of the 10 string guitar he designed at the beginning of the 1960s. First of all he did a few tests based on the ‘viola d’amore’ but as he didn’t get satisfactory results he sought the collaboration of Narcisco Yepes who gave him a lot of help developing this instrument. He also designed the 8 string guitar together with the guitarist José Tomás.